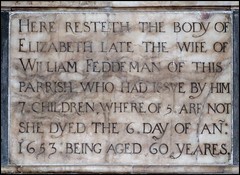 Just imagine for a moment an early 16th century citizen of Ipswich thrown forward in time, ending up in the early years of the 21st century. What would he think of his town? Well, given the changes there have been over the last half a millennium, it would probably be about three days before he got around to looking at the churches; but when he did, I wonder what he would find familiar, and what would puzzle him? 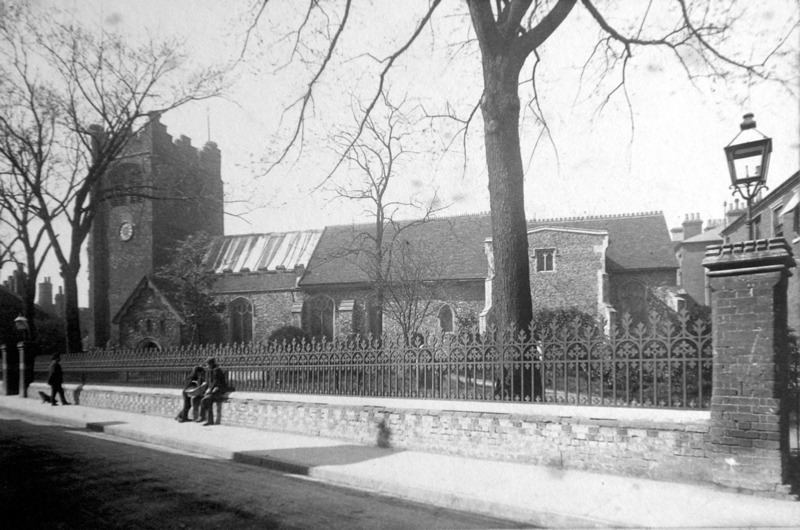 In his day, Ipswich was still the fifth largest town in England - it would struggle to make the top 50 nowadays - and the twelve town centre parish churches are all still there. Among the many things that might surprise him is that hardly anyone lives in the town centre anymore, and the central parish system has disappeared. 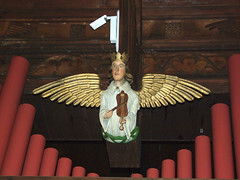 Six of the medieval churches are consequently redundant, and subject to various fates. Of the other six, St Matthew, St Margaret, St Helen and St Mary at Stoke find themselves serving vast hinterlands stretching out into the suburbs. This has renewed them, and given them vital roles to play. One imagines our time traveller gazing out at the Foxhall Road and Bramford Road areas, and wondering why all these people are living on the heath when they could be living in the town centre. The last two are still essentially town centre churches. St Mary le Tower considers itself the Civic Church; I'm never sure what that means, beyond the fact the Mayor gets to attend services and former England managers have their funerals there. It is, ultimately, very big, although I wonder what our 16th century Gyppeswickian would make of its 1860s rebuilding. 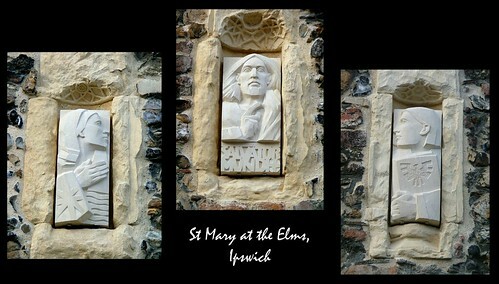 And so we come to St Mary at the Elms. This is a smaller, quieter building than its brash neighbour, but the community here have worked hard to develop the church's town centre role, including introducing something that the time traveller would find quite natural, but for many of us today seems extraordinary. 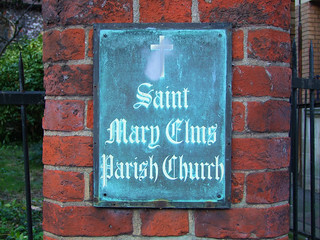 St Mary Elms, popularly known by Ipswich people as simply the Elms, is a gorgeous little Anglo-catholic shrine. 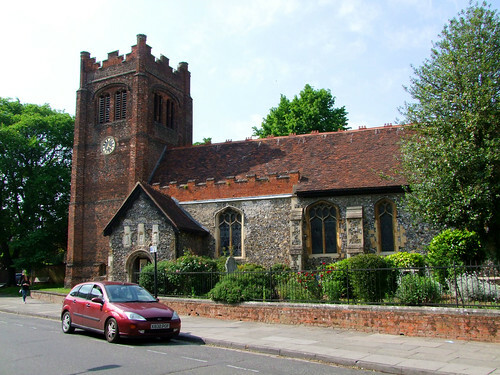 Despite the tower-blocks and bleak 1960s low-rise office buildings which surround it, it sits in peaceful calm, with a wildlife sanctuary of a churchyard to the east. To the west is a public space with a sculpture and benches. To the north stands an ancient inn; you can't help but be reminded of the way the pub and church stand together in so many Suffolk villages. Across the road are old cottages and the former school, more recently a register office, and it does not take an enormous leap of the imagination to conjure up what this area was like before the slum clearances of the 1950s and 1960s, as long as you ignore the court buildings. 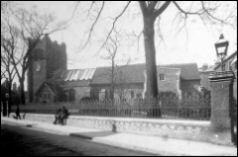 Until the early 1990s, the Elms maintained a militantly Anglo-catholic tradition, and a fairly steady congregation of people who liked that kind of thing. 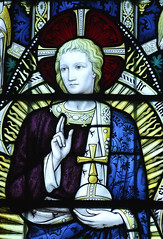 But the decision of the Church of England to go its own way on the issue of women priests had consequences here, and a number of the congregation were received into the Catholic Church. The surviving parish members might have just soldiered on in that martyred fashion beloved of Forward in Faith members in the mid-1990s, but instead the church renewed itself as a welcoming and sacramental space for pilgrims, strangers and passers-by, not just for Mass and the devotions of the Anglo-Catholic faithful, but simply as a peaceful place. The main door is open all day, every day, and the Elms has become the busiest church in the town centre. 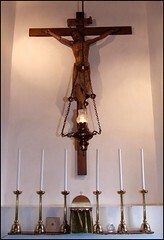 And there is still a daily Mass, of course. 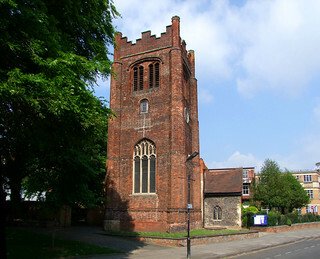 Most Ipswich people would associate St Mary Elms with its landmark red tower. 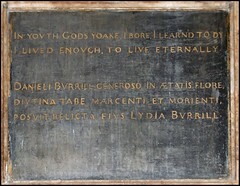 Legend has it that bricks from Wolsey's ill-fated college were brought here and used instead. 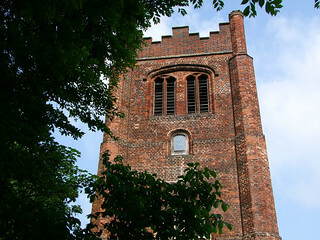 It is one of Suffolk's finest Tudor towers, but the church here is much older than that - in fact, it probably incorporates part of the structure of an earlier church, St Saviour, which stood on this site. The tower is certainly a handsome one, especially when floodlit at night. 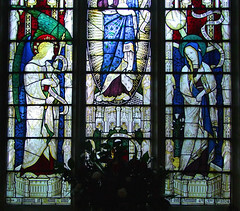 Beside it is the equally handsome porch, with its three image niches containing Charles Gurrey's super triptych of sculptures depicting Christ flanked by the Blessed Virgin and St John. What the porch contains is extremely interesting. The Norman doorway is by no means Suffolk's finest. But there is considerable evidence to show that the door, and its decorative ironwork, is as old. It is probably the original 11th century door. This would make it one of the earliest structures still in use for its original purpose in the county. As you step inside, you should remind yourself that, whereas Ipswich's other Anglo-catholic flagship St Bartholomew is a purpose-built ritualist church, St Mary Elms has had to accomodate its tradition to a Reformation-altered space. This has sometimes meant restoring pre-Reformation integrity, but other needs of Anglo-catholic practice have been met in less orthodox ways, and an arson attack in 2010 led to other refurbishments. 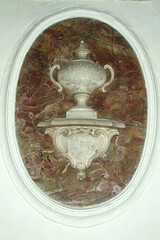 Various features unearthed during the late-19th century restoration have been pressed enthusiastically into use - the holy water stoup, piscina, etc. 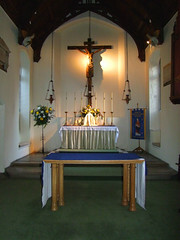 Since the Catholic Church reformed its liturgy at Vatican II, St Mary Elms has gone down the same road, introducing a small altar under the chancel arch, although the high altar is still retained. 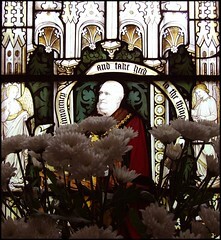 There is a lovely Comper window, commemorating Walton Turner, a churchwarden for 55 years who was also Mayor. He kneels at the bottom of the window in his regalia. 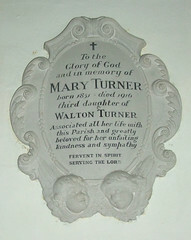 His wife Susan is remembered by five figures of Christian virtues on the south side. 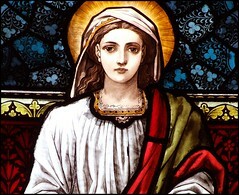 She appears herself as Purity, the most easterly of them. 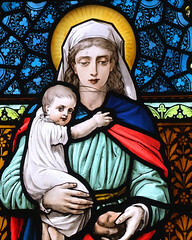 The windows are the work of George William Taylor soon after he had taken over the O'Connor workshop in Berner Street, London in 1877. Indeed, the windows are actually signed Taylor late O'Connor. I always find Taylor's manga-eyed women a bit mawkish. But in the end, Taylor was unable to revive the O'Connor's fortunes. The mass-produced glass of the workshop was becoming unfashionable with the rise of the Arts & Crafts movement, and they weren't able to compete with the economies of scale of the really big workshops like Hardman & Co and Ward & Hughes. 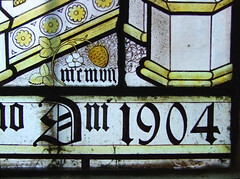 They produced their last glass in about 1900 and the company closed soon afterwards. 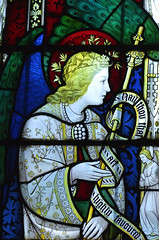 The better window in any case is Ninian Comper's, to her husband, in the south aisle. The modern rood, with great drama, replaces an east window. 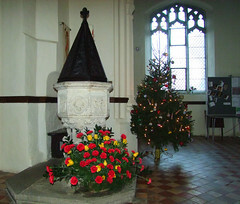 Notice also what is perhaps Suffolk's finest Victorian font (not hard, I know) with its Gospel scenes. 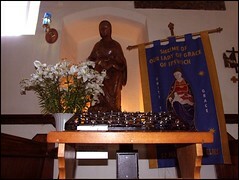 And then there is the shrine to Our Lady of Grace, recently and lovingly restored. 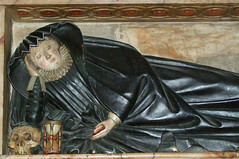 The replica statue is by Ipswich carver Robert Malamphy, and it was dedicated with great ecumenical ceremony in September 2002. I was there, and it was wonderful to watch leaders of the local Anglican, Catholic, Orthodox and Methodist communities, as well as representatives of other churches and of Ipswich's Muslims who also venerate Mary, come together to return this devotional focus to the Borough. 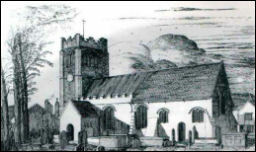 It was a shame that the church was picketed by extremist protestants before the service, although I guess that the Anglo-catholics rather enjoyed the sense of siege. The medieval shrine was just around the corner; turn up Black Horse Street, and eventually you reach Lady Lane. I suppose our 16th century citizen would find it more of a surprise that it was ever destroyed, rather than that it had been returned. 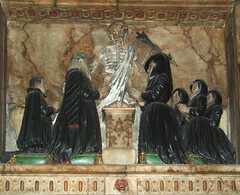 The restoration of the shrine was the twenty years work of a group of enthusiasts, Meryemana, who were based at this church and the Catholic church of St Pancras. The image is a copy of the one at Nettuno in Italy, which many people believe to be the rescued statue of Our Lady of Ipswich. You can read more about this on the entry for the original shrine. 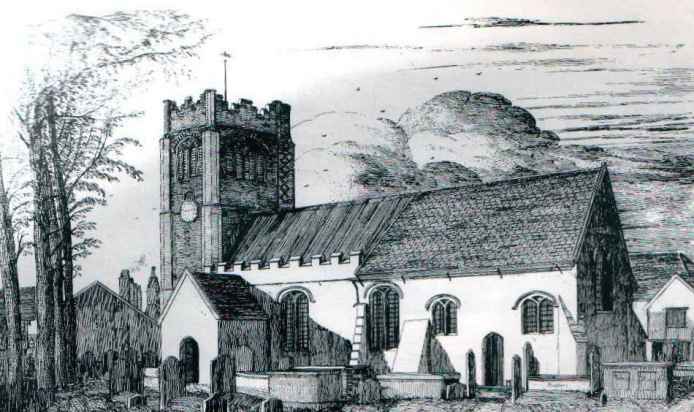 Edward Bishopp was responsible for the chancel; you can see Henry Davy's 1842 engraving of the church before this was built below, and a late 19th century photograph from shortly afterwar the restoration is on the left hand side of this page. Note that, in Davy's picture, the porch appears to be cemented over. It is interesting to see how, in the course of the century, Elm Street cut across the middle of the graveyard. 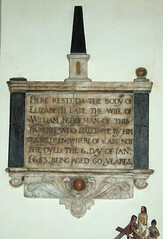 In the chancel, Bishopp placed the grand 1616 wall monument to William Acton. 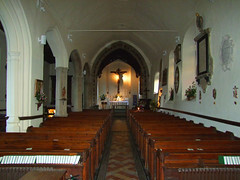 The north aisle was built in the 14th century, but extended by the Victorians. The church had two transepts; the northern one survives. The Commonwealth arms here were destroyed in the fire. I remember visiting in the spring of 2003, when the world had undergone another of the traumas that had afflicted it ever since Bush had been in the White House. 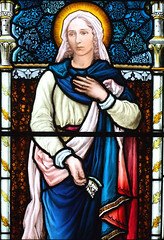 Although anti-war feeling wasn't as strong here in Ipswich as it was up the road in Cambridge, where there were massive demonstrations and Labour MP Annie Campbell resigned from the government, it still made itself felt, particularly among faith groups. The Church of England, the Catholic Church, and many of the non-conformist Churches in Suffolk came out bravely against the bloody conflict in Iraq, and in Ipswich a focus was this lovely little church. 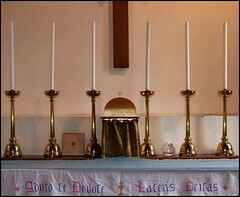 A candle was lit for peace in the days before the fighting started, and during the violence it became a focus for prayer. 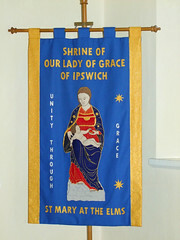 It was a noble and much appreciated gesture by the parish - the sort of thing a Cathedral might have done, if Ipswich had one. Finally, go into the pretty little space to the west of the tower. Until the 1950s, there was a pair of houses here, but now it is open, green and beautiful, with that lovely sculpture. A gateway to the north of the tower takes you through to the St Mary Elms cottage of the 1470s; it is the oldest inhabited building in Ipswich.